This is the second blog post in a series by senior History and Finance major Brendan Courtois on an ledger documenting the Jesuit-run booktrade of the Missouri Valley in the 1840s. In order to better understand the book trade of the Jesuits of the Missouri Province from 1842 to 1849, I applied modern accounting methods to the data recorded in the surviving ledger. I identified a two years period (April 1842 to March 1844) to use as a test case. Rather than employing the specific techniques utilized by companies today, which require precision in timing and amount, I turned to modern accounting concepts, such as cash flow and inventory turnover. (These specific terms are anachronistic to the period of the ledger, but were understood in terms of the amount of cash and inventory.) If Jesuits ran this book trade today, their financials would have to keep track of the inventory, sales, investments, and overhead. They would have to make sure they correctly attributed these numbers to the time period in which they occurred or were assigned. The surviving data from the book trade, however, does not allow for such a full reconstruction, so I have to scale back my analysis to what is actually recorded. This ledger covers the years 1842-1849 throughout its five sections (Cash, Ledger, Bills, Sales, and Expenses). As I mentioned in my previous post, these sections don’t exactly line up with our modern definitions of the words. The sections all cover different timelines as illustrated in this chart. 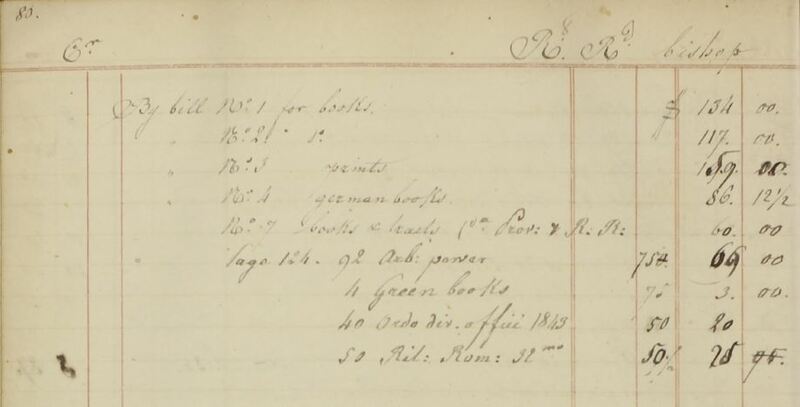 Sections of the Jesuit Book Trade Ledger, collection of St. Louis University. There are several different things going on in the ledger, but a rough reordering of the data reveals that the Jesuits used it to record a) the books they purchased from wholesalers and printers and b) the books they sold to various Catholic individuals, parishes, and institutions throughout the Midwest. In order to gain some insight into the operation of the Jesuit book trade, I compared several years from the Bills and Sales sections of the account because they generally represent the revenue and cost of the financial transactions of the trade. I have ignored other expenses, such as shipping, that would increase costs because I haven’t found an efficient way to allocate them, or how the creators of the ledger allocated them. It is possible that these expenses were thought of as separate and not rolled into the overall cost as the accounting practices of the time were not yet standardized. In addition, the Bills and Sales sections have the longest spans of corresponding data in common, which make them a good starting point to compare income to costs for the trade. As a test case, I compared the monthly costs for the Bills and Sales sections from April 1842 to March 1844. In order to gather these number totals I had to make some assumptions about the allocation of the numbers into particular months. It is sometimes difficult to tell in the account which transaction belongs in which month because the labeling on months and transactions is not consistent. On multiple occasions a transaction has a particular date that is in a different month than the one listed at the top of the page. In these cases, I utilized the date next to the entry for the time of the sale. (I used the overriding header of the page as date of sale in all cases where the individual transaction date was not recorded.) In addition, the presentation of numbers is not consistent throughout the document. For example, from June 1843 – July 1845 in the Sales section the sales are not totaled for each page, but for the rest of that section they are. Finally, for ease of addition, I did not include any ½ cent entries to my calculations and rounded down, which may also skew the numbers. While the numbers in the test case are not conclusive, they suggest general trends in the data. From April 1842 to March 1844, the Bills section totaled $4,039.37 and the Sales section totaled $4,624.18. (PDF of breakdown by month Accounts 1842-1844.) This broadly means the Jesuits took in more money than they spent. Of course, this is not counting any other attributed expenses such as labor, shipping costs, maintenance, and other indirect expenses such as lighting/ heating. Labor is a cost I won’t be able to attribute. It is possible that only Jesuits, who did not draw a salary, worked in the trade. They incur labor costs, but if they are tracked at all, they are not attributed anywhere in this account. Shipping costs are directly placed in the Expenses section, but that section only runs from May 1849 to September 1849, so it is a relatively small window, and beyond the test case. Maintenance, heating, and lighting costs are not going to be reflected in this account as they represent indirect costs that would not be consciously thought of as a cost of doing business in this time period. These combined expenses of running the trade may outweigh the revenue from the sale of books, but based on the raw differential between revenue and sales it seems that the book trade was making money over this two-year period. Snapshot of the Expenses section of the ledger on page 470. This is an example of the accounting of freight expenses as separate from the cost of the goods themselves. The two-year test case provided insight into the month-to-month operations of the book trade. 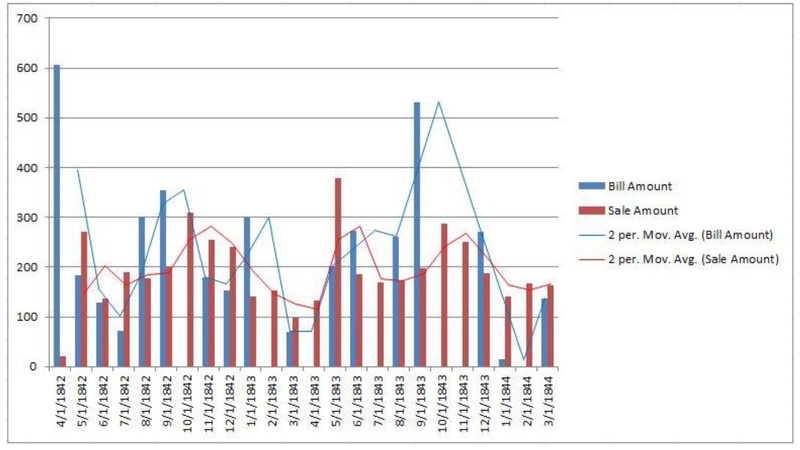 Specifically, the sales account had more consistent transactions month-to-month than the bills account. There are six months over the two-year period that the bill account has no transactions associated with it. In addition, the bill book records two instances of large orders over the test case (April 1842 at $606.87 and September 1843 at $531.76) while the highest month for sales is $379.11 (in May 1843). In all likelihood this means that sales were recorded close to or at time of transaction, while the bills account were recorded as the orders were made with book suppliers. Based on the inconsistencies in the numbers, it seems that the Jesuits handling the book trade were ordering based off inventory stock rather than anticipating needs of certain books. This makes sense, given their accounting capabilities. Graph of the two-month moving average trend line for both the sale and bill accounts, April 1842 to March 1844. In the months I’ve spent looking over these financial records I’ve uncovered a lot more questions than answers. However, I do have some initial findings and thoughts. Primarily, there are differences in data totaling. Sometimes the account totals numbers for each order, at the end of the page, and for a whole month. However, the comparison of numbers never extends beyond the month benchmark. Any time a month is added up, it is done off to the side (pictured below), and that number does not appear anywhere else in the account. In addition, these differences in addition seemingly occur at random, and at times the account has full pages dedicated to missed entries. The sections cover different months, another instance of irregularity. The Bills section features a few entries from larger clients that reference other pages in the document, but this is the only time the sections interact with one another directly. There is one instance of comparison of revenue to costs in the account, which occurs on page 74, near the end of the cash section. The one instance of comparison of revenue and costs in the account on page 74. From the frequent changes in presentation, addition of transactions, and references, I am led to believe that the person(s) responsible for this document was primarily concerned with record keeping and not with demonstrating financial solvency. It is fair to say that in this time period, before widespread formal accounting standards, those responsible for this account simply did not possess the methods necessary to answer the financial solvency questions they had. Today, accounting methods are able to answer a number of questions such as profitability, inventory turnover, and risk of businesses with equations and large amounts of data. A business in the 1840s would be able to notice relative demand and profitability of their endeavors but not much else after calculations. But considering the inconsistency throughout the account in the treatment of numbers I would say it is more likely that the author(s) did not feel required to invest time into doing such. An instance of the Ledger section referencing the Bills section of the account, p.80. In the coming months I plan to look at the cost of the items purchased by the Jesuits and the amount they charged for the books. I also want to look more closely at the cash flow for the full time period the account covers.